Another short weekend - not away til Saturday morning, so a close to home location was required. 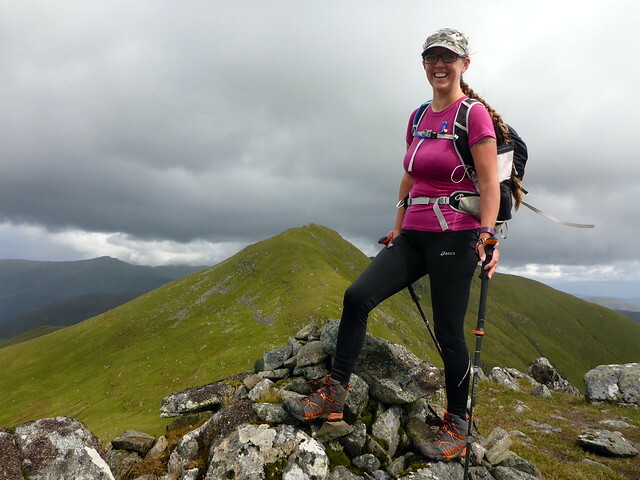 I'd thought we could do some of the Lawers hills on Saturday making sure we got the Top of Creag an Fhithich for Allison. 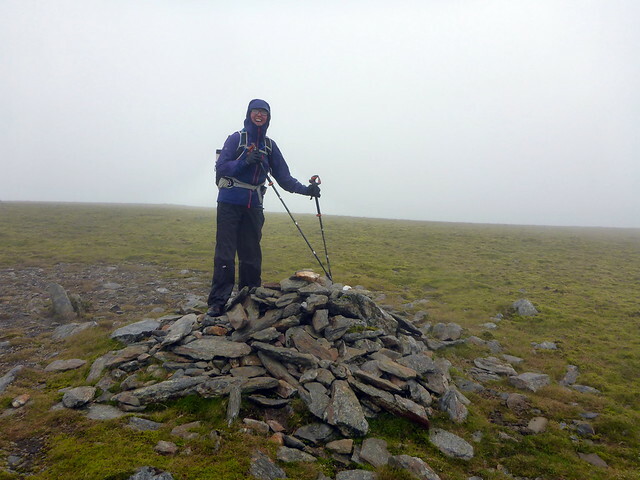 For Sunday I'd drawn a route from Fortingall to take in some Simms as well as the Top of Meall Liath. Forecast was for showers, lots of them. 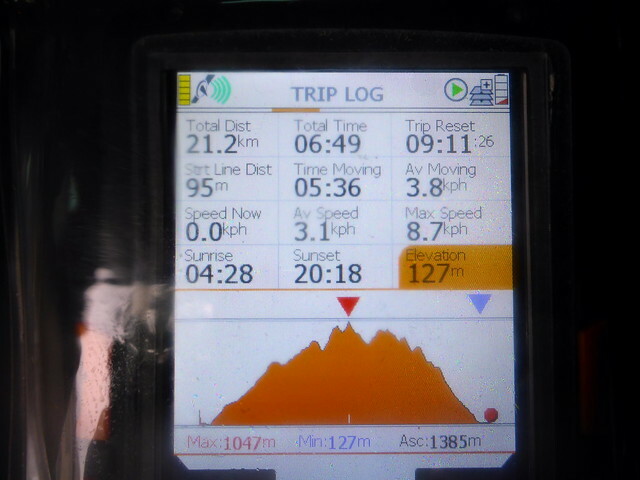 Reasonable journey up the A82 allowing us to make a start on Lawers for 10am, from a busy car park. 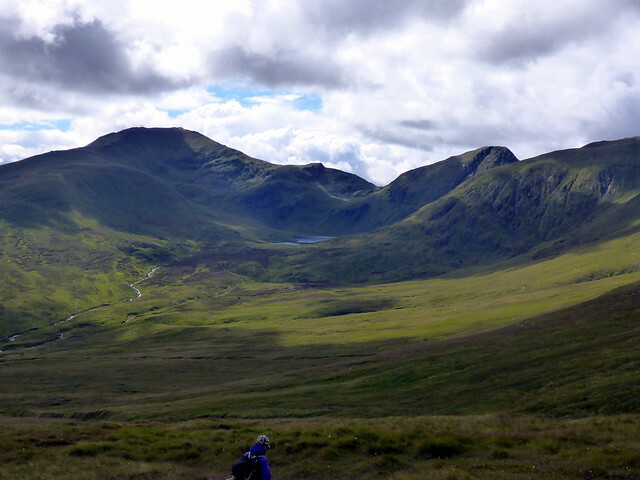 I'd planned to go over the ridge to Meall Garbh then drop down into Fin Glen and add Meall a'Choire Liath and Meall Corranach, although I had some doubts about crossing the Allt a'Chobhair. 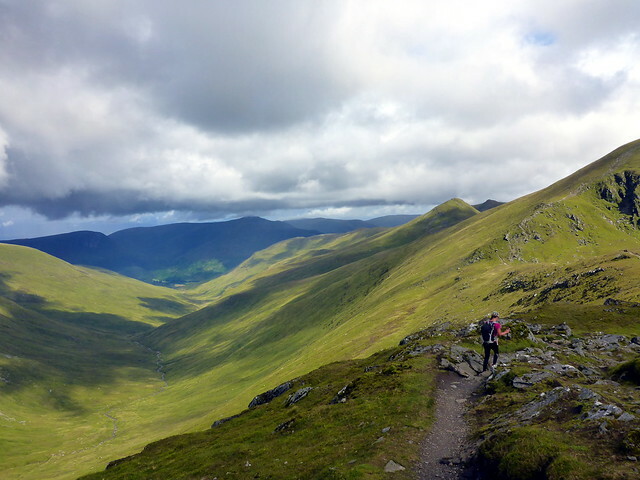 Easily up the track to Beinn Ghlas, passing a number of other walkers. Sunshine instead of the expected rain. 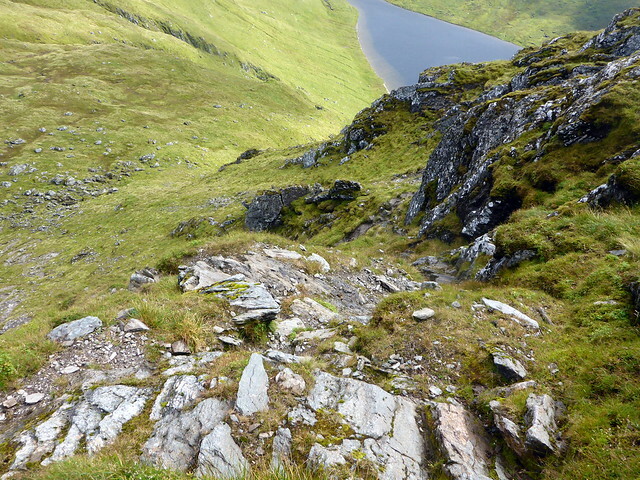 Down and then up to the summit of Lawers, continuing on the path to the diminutive Munro Top of Creag an Fhithich, a pile of stones from this viewpoint. We pause for lunch whilst a heavy shower starts. 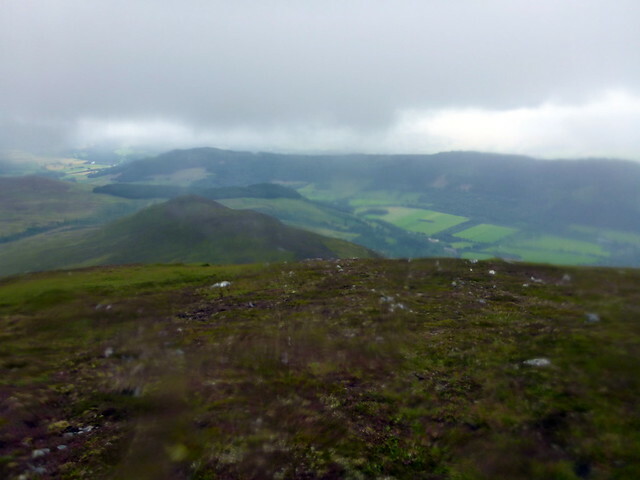 The rain doesn't last too long and as we climb to the top of An Stuc the sun is back out and the landscape is actually steaming. 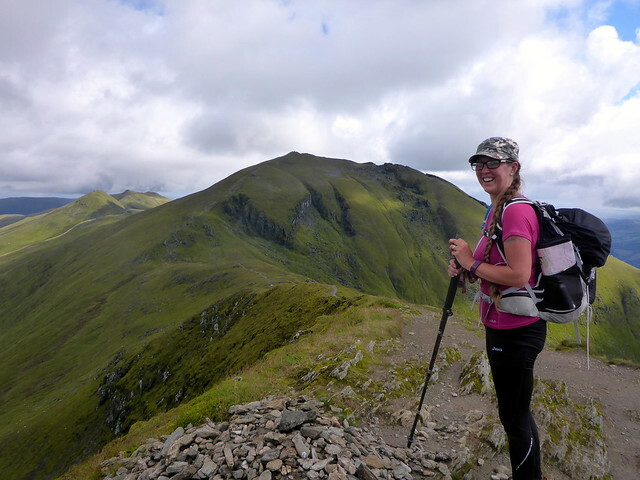 It's now time for the descent from An Stuc - haven't done this before as the last time we climbed An Stuc was in hazardous snow and we ended up descending from Meall Garbh to Lochan nan Cat and up Raven Gully. I'm wearing trainers and the rock is wet. We see a couple of folk going down a path to our right - there's also a gravelly path that seems to go straight off the front. 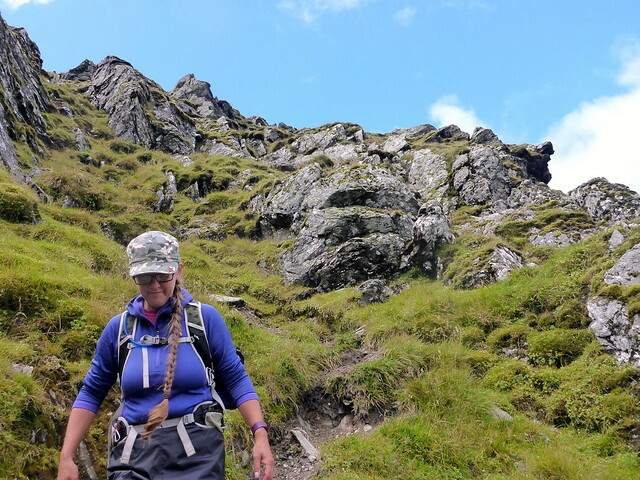 Allison's keen for a scramble and descends to have a look. A couple of guys have just come up the path and one seems concerned that we might go down the scrambly way. Anyway, Allison reckons it's fine to proceed and we do - couple of slippy sections but lots of good holds and we get to the bottom of the prow without incident. 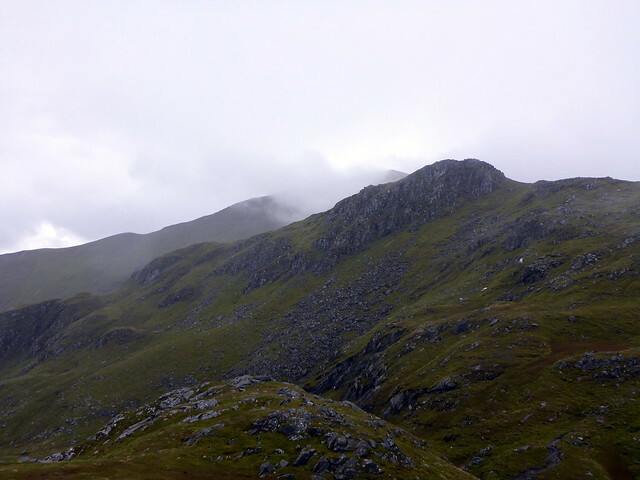 From here it's follow the path up to Meall Garbh and decision time. Looking across at the river, it seems in full flow. Hmmm. 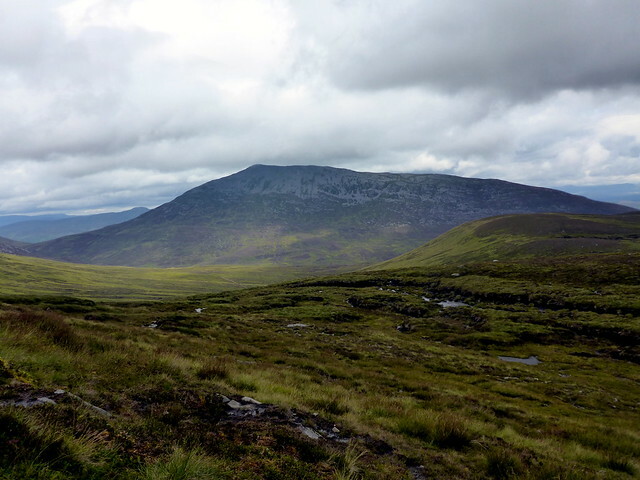 We could walk upstream into Coire Liath where it will be easier to cross, but then the mountainside up Meall a'Choire Liath is a good deal steeper in there. 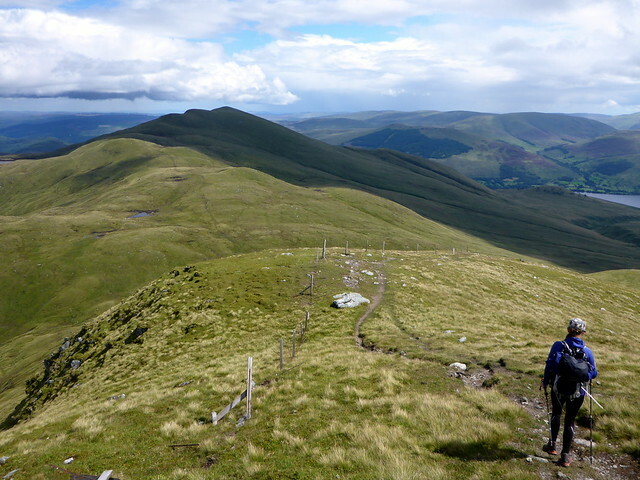 Or we could just go on to Meall Greigh and complete the circuit of 5. In the end, that's what we decide to do although we know it's a bit of a walk back to the car. 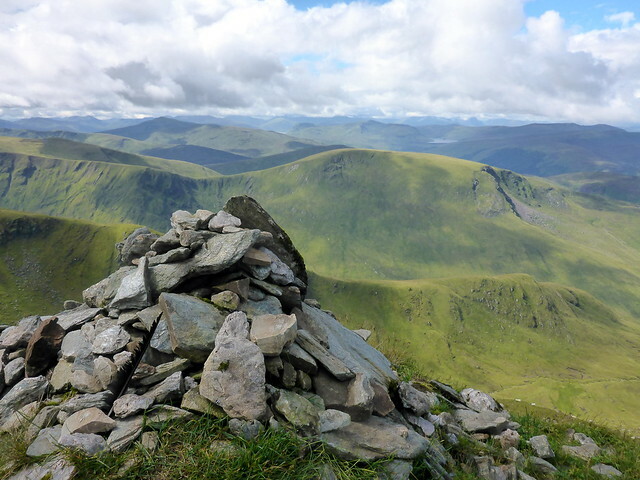 We catch up with a couple from Glasgow who are doing the same (I think each of us hoping the other might have left a car at Lawers) and walk together up to the top of Meall Greigh. From there it's down the hillside aiming for the dam and the track beyond. A bit boggy in places but ok. We reach the track and press on, keeping an eye out for struggling insects in the many puddles to rescue from a watery fate. We meet a sheepfarmer on a quad bike who tells us we could just keep going along the hillside after the track runs out - I had thought we'd need to follow the track down to Tombreck, so this is welcome news. Eventually the track ends at a dam in a steep walled gully - we cross over and continue contouring along the hillside, following a line of water intakes on the 550m line. 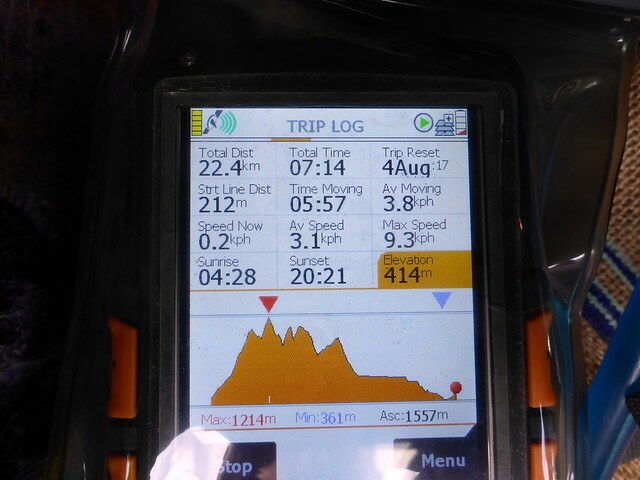 We approach some crags, which we drop beneath and continue along at around 450m for a while. We can now see the road - as both of us are finding the constant contouring a bit sore on the ankles we descend to the road and walk a short distance back to the car. A good day out. 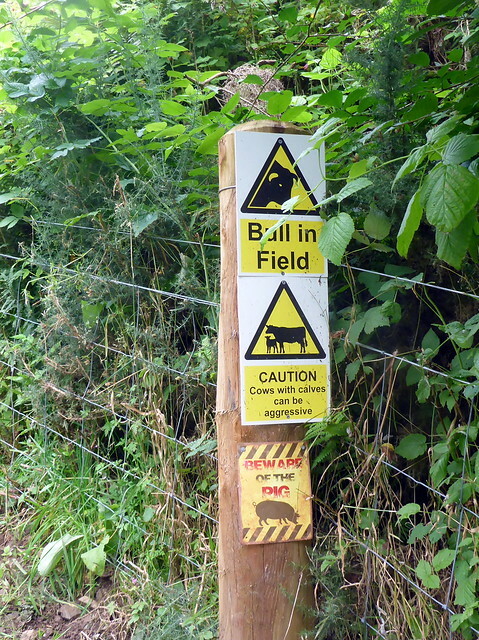 We drive to the nearby Cruachan Campsite and pitch in the middle of a soggy field. Not stayed here before - a very friendly Aberdonian lady greets us at reception, we get the tent up before the next rainshower starts but manage to get a wee while sitting outside before the midges become oppresive. Not much sleep due to various campsite noises. Sunday - clag down. Drive to Fortingall where parking is a bit tight - end up parking in the Hotel carpark. 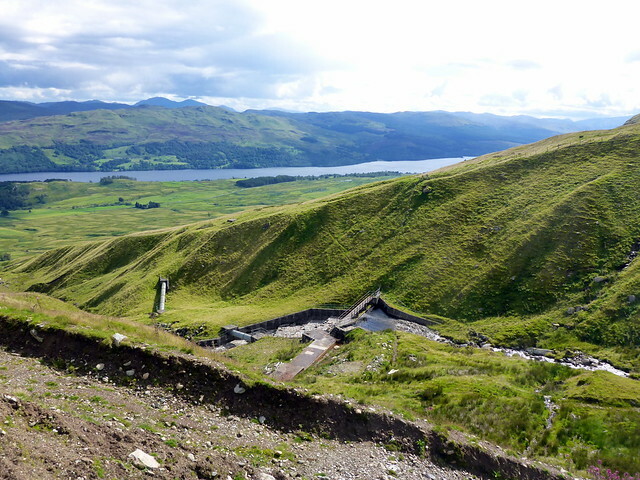 I'm not exactly sure how to get onto the hill track and we wander about a bit, finding a "Private, no access to Hill" sign up on the Glen Lyon House gate. We investigate a cluster of houses just west of the river and yes, this is access to the hill. 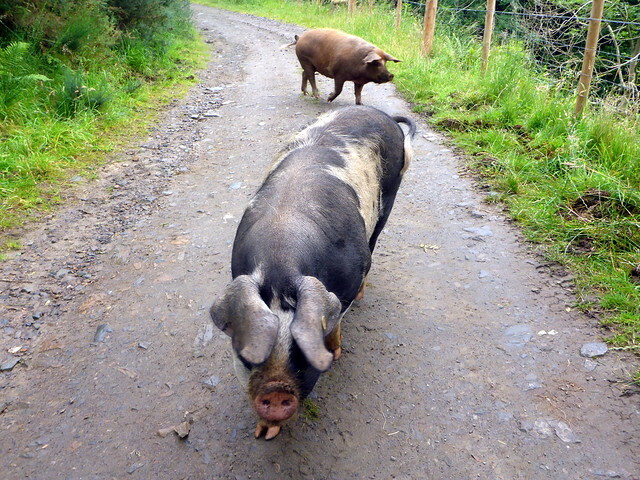 There are a variety of warning signs on the way in and we meet several large pigs who are quite happy to have their backs rubbed. 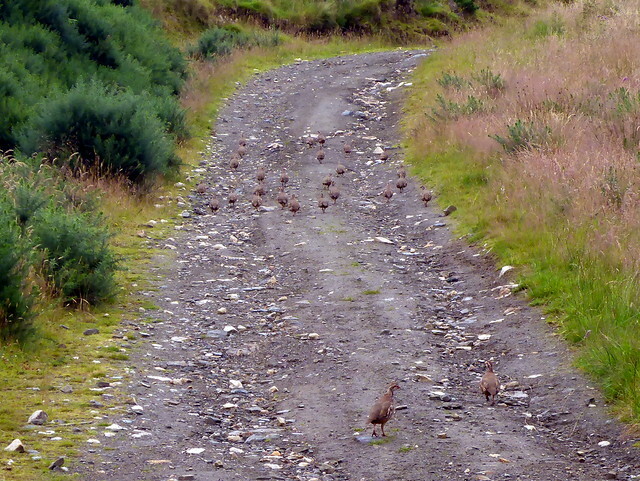 A squadron of young grouse march up the track ahead of us, every so often flying off then landing on the road further up. 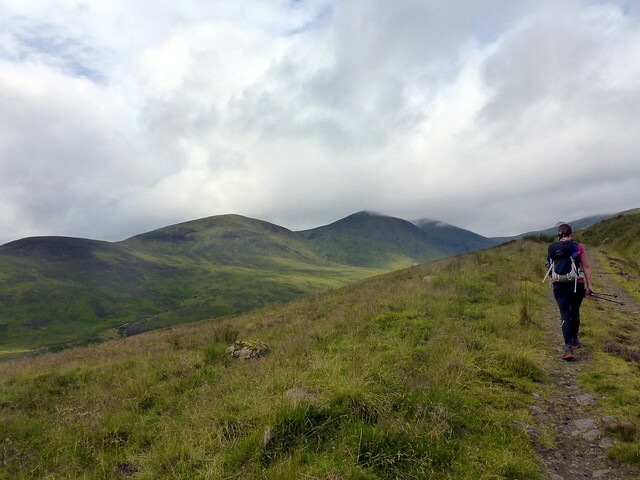 we march along behind them, looking at the twin shoulders of hills that we'll be ascending then returning on. 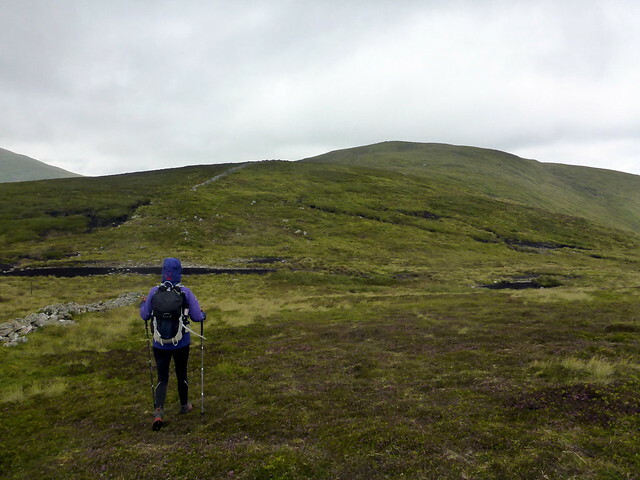 We leave the track around 640m to take in Meall Crumach (a subSimm - and definately not worth the effort as it is boggy and riven with peat hags on top). This does afford us an unusual lateral view of Schiehallion. 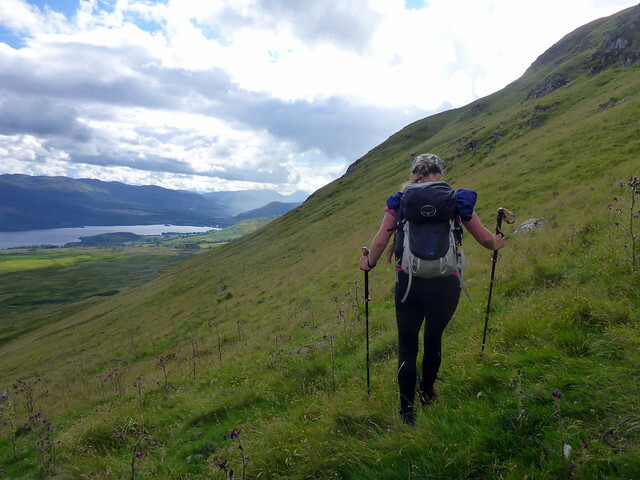 Returning to the track, sadly for only a couple of hundred metres, we then turn up to the right and climb the flanks of Meall an Eun. 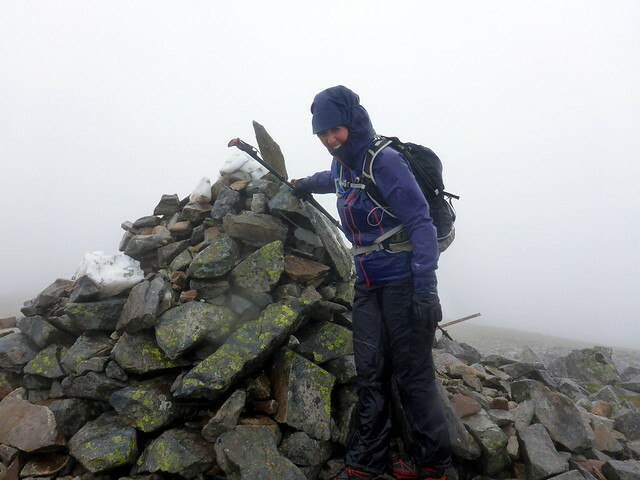 Once again, around lunchtime, the rain starts, only this time it doesn't stop and the rest of the walk is spent in wet/cold claggy conditions. 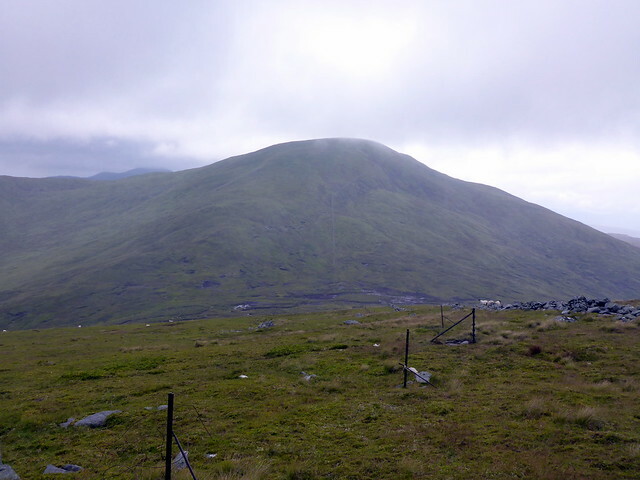 From Meall nan Eun it's 250m up a steep grassy shoulder of Meall Liath, Allison's Munro Top target of the day. 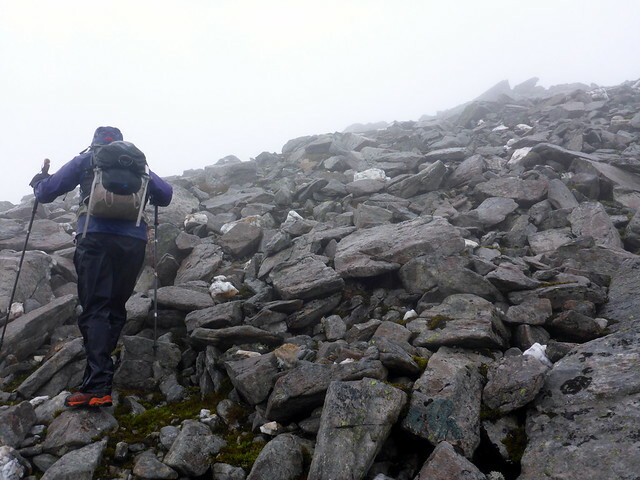 On to the rocky summit of Carn Marig then following the clear path to Meall na Aighean. We meet a couple of guys, dad and less than enthusiastic son by the looks of things. 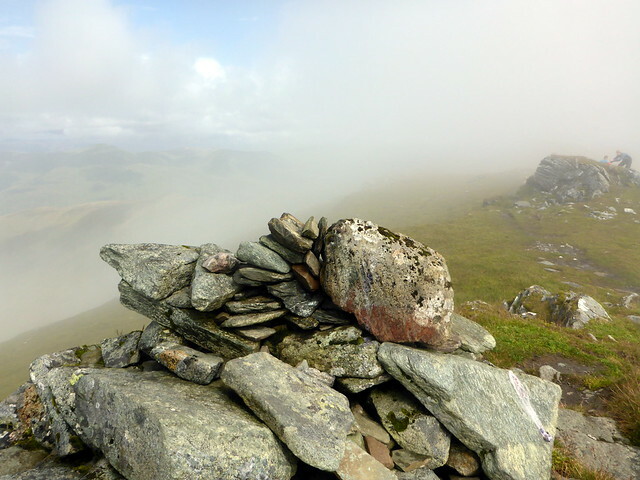 Leaving them at the summit of Meall na Aighean we continue down the eastern shoulder taking in the Simms of the Eastern Top and Creag Mhor before dropping down over Beinn Dearg. I can see the track wending its way beyond the new native tree plantation and make for it, enjoying the smell of the young pines we walk through. Through some sets of gates then onto the track which eventually brings us back to the road via the neatly beech-lined avenue of Glen Lyon Farm. Back at the car we get off our wet footwear and decide to have a pint in the Hotel, as we've used the car-parking. Nice little place even though we did have to repeatedly ring the bell for service. 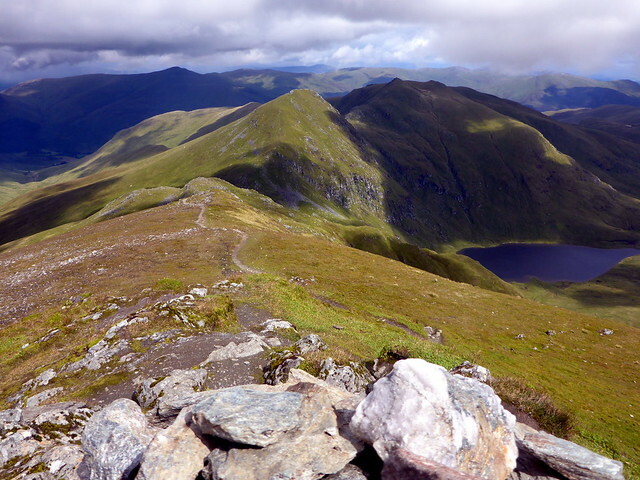 A really nice group of hills these, and good to see that you got decent weather for the Lawers range, notwithstanding the iffy forecast. 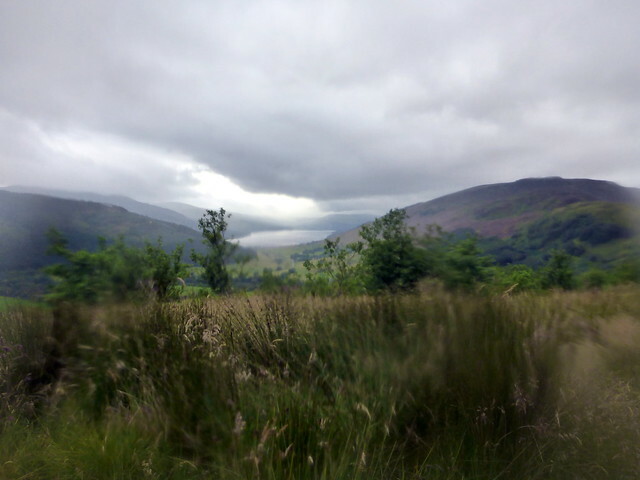 Pity the weather didn't fully play ball for Glen Lyon. 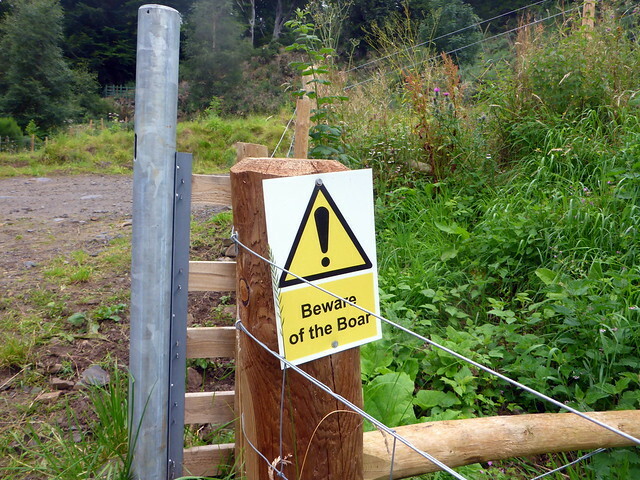 But at least you survived the (wild) boar . I remember well the odd perspective of Schiehallion - I wasn't even sure I'd correctly identified it.